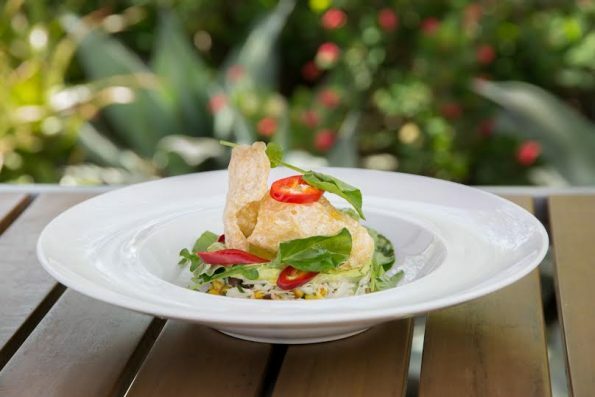 Gertrude’s, the highly touted full-service restaurant located just inside the Desert Botanical Garden, is now serving new Spring menu items at lunch, dinner, and weekend brunch. Under the direction of Executive Chef Matthew Taylor, Gertrude’s ingredient-driven seasonal menus meld extraordinary fresh flavors with subtle local and Southern influences. Chef’s favorite new menu items include the flavorful swordfish with tamarind-bacon vinaigrette and walnut tapenade that masterfully blend the acidity in the tamarind with the salty olive and savory walnuts. Another is the smoked tofu with curry salt and tomato condiment. The tomato condiment is his grandmother’s recipe and truly delicious. Additionally diners can continue to enjoy the popular Salt Spring Island mussels, blackened scallops with roasted corn maque choux + Tabasco® Hollandaise, and the award winning smoked pork gumbo.